Printable Black & White PDF Printable Color PDF More Paper Dolls & ClothesI’m going to close out this week with steampunk paper doll styles. 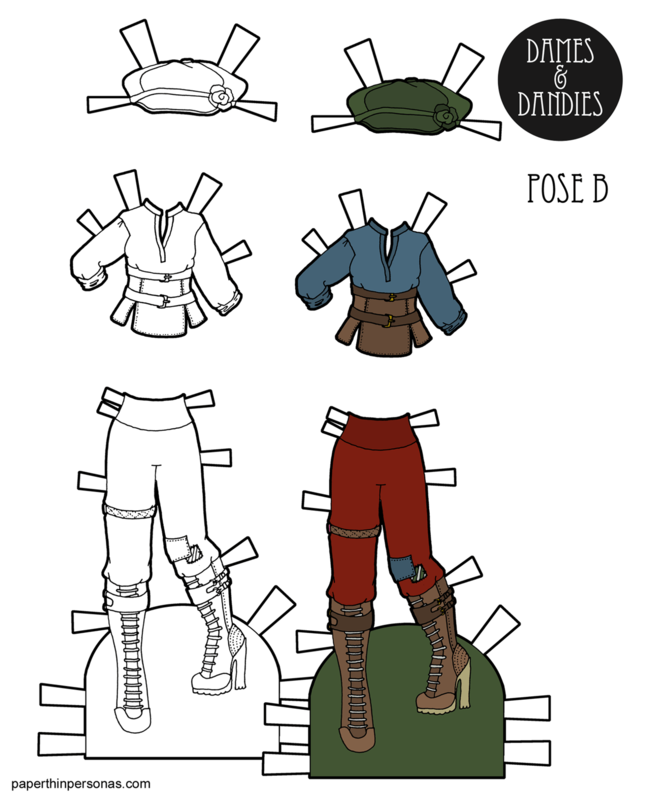 This is the first and then there will be a steampunk B Pose paper doll to wrap up the week. Next week, I’ll be debuting a new paper doll post image style (I hope) or I won’t get it anything done and I’ll have to go on hiatus to catch up. Meanwhile, I really wanted to design a steampunk paper doll costume that wasn’t “fancy” and felt a little more like what a working person in a steampunk world might wear. I decided to do a similar color scheme for today’s outfit as I did for steampunk Changrui which was a big inspiration, I confess. Sometimes when I am drawing one paper doll set quickly brings me to another paper doll set in a sort of paper doll cascade. What do you think? Do you prefer your steampunk more “street” or more “fancy” with ruffles and top hats? I’d love to hear your thoughts in a comment. The download links lead to the retro inspired dresses. This is annoying. I think there’s something going on with my WordPress and saving revisions, because I know a double checked this last night. Oh well, that’s my problem, not yours. It should be fixed now (I hope) and let me know if it is not.